THIRTEEN’s GREAT PERFORMANCES continues the cherished tradition of ringing in the new year with the Vienna Philharmonic at the opulent Musikverein, under the baton of Italian conductor and Chicago Symphony Orchestra Music Director Riccardo Muti, featuring favorite Strauss Family waltzes accompanied by the dancing of the Vienna State Ballet. This year’s program welcomes new host Hugh Bonneville, best known as Robert, Earl of Grantham, in Masterpiece’s global phenomenon, Downton Abbey. “I’m honored to have hosted this timeless tradition for eight years and will continue reveling in Vienna’s wonderful history, music and picturesque beauty,” said actress and author Julie Andrews, who has starred in numerous GREAT PERFORMANCES productions over the last three decades. “I look forward to toasting Hugh Bonneville, the Vienna Philharmonic, and all my friends at GREAT PERFORMANCES on New Year’s Day.” Prior to Andrews’ tenure beginning with the 2009 broadcast, the venerable CBS anchorman Walter Cronkite served as the New Year’s Day concert host for 24 years through 2008. In addition to performances of waltz favorites like “Tales from the Vienna Woods” and “The Blue Danube,” joining the Strauss Family repertoire is music by Alphons Czibulka, whose “Stéphanie-Gavotte” provides the soundtrack to a pas de deux at Emperor Franz Josef’s private train station—which was ultimately used just twice. This year’s other ballet performance features dancers from the Vienna State Ballet waltzing to “Roses from the South” by Johann Strauss II at the Schloss Eckartsau hunting lodge. 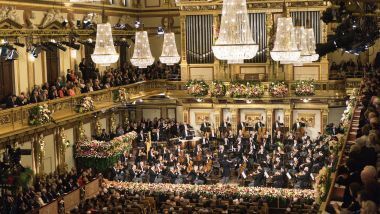 The Vienna Philharmonic’s traditional New Year’s program is the largest worldwide event in classical music reaching millions of people annually through radio and television in over 80 countries. The program has showcased Viennese musical culture at the highest level, and since the first television broadcast in 1959, sent the world a New Year’s greeting in the spirit of hope, friendship and peace. This year’s telecast marks Muti’s fifth time conducting and the 34th broadcast of the event on PBS. From Vienna: The New Year’s Celebration 2018 premieres on GREAT PERFORMANCES Monday, January 1, 2018 at 2:30pm on PBS (check local listings) with an encore performance 9:00-10:30 p.m. on PBS (check local listings). The broadcast will available to stream the following day via pbs.org/gperf and PBS OTT apps.